Simon Page College of marketing continues to excel in Digital Strategy. The recently released the results of the CIM Exams had Simon Page record yet another remarkable pass rate. 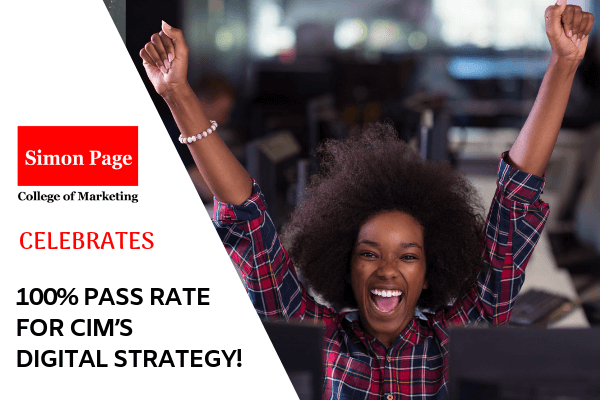 With 100% pass rate for Digital Strategy, Marketing, Driving Innovation and Strategic Marketing; this goes to show that Simon Page definitely offers you the very best in Marketing Qualifications in Kenya. It’s no surprise that this study centre still maintains quite an impressive performance rate for the past 4 years since its establishment, here in Kenya. Apart from being industry leaders in their various fields our tutors are also CIM accredited. They are focused on making the learning experience more practical and enjoyable. For students, this means they receive a wholesome learning experience setting them up to succeed in their studies. Thus, many students relate their success to the college’s “good culture” brought about by both students and faculty’s hard work and collaboration. Majority of our students are professionals who have juggle between their careers and classes. At Simon Page, we offer face to face lectures as well as online sessions. Having flexible study options allows them to fit in classes into their busy schedules and still have a good balance of both professional and academic lives. The vision of Simon Page is to be recognized as a continental provider of world class management development experiences. Therefore, the course work is mostly based on getting the students to absorb more skills than just the theory. A greater part of the assignments is practical which helps them not only improve their critical thinking but also develop good strategic marketing skills. The Faculty and entire Simon Page College of Marketing team would like to congratulate all the students who recently completed their CIM qualifications and appreciate them for making Simon Page the best.